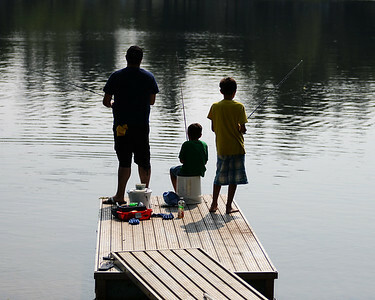 RYAN HUTTON/ Staff photo From left, Oscar Figueroa, Noah Figueroa, 6, and Christain Scheren, 10, wait for a bite during the Derry Village Rotary Club youth fishing derby on Sunday. 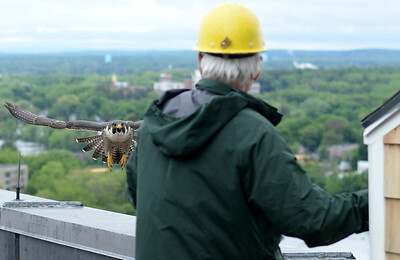 RYAN HUTTON/Staff photo Merri, one of the adult peregrines falcons that lives on top of UMass Lowell's Fox Hall, attacks MassWildlife's Tom French as he approaches her nest to return her four chicks after removing them to tag them. RYAN HUTTON/ Staff photo. 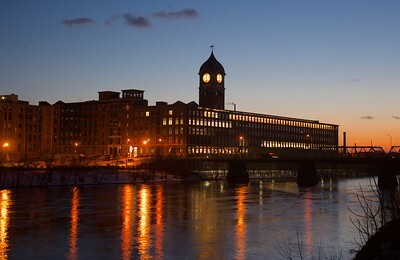 Lights have been added to the clock face at the Ayer Mill. RYAN HUTTON/ Staff photo. 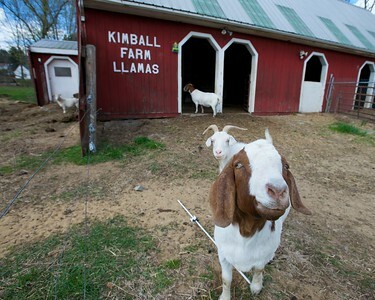 Goats on Kimball Farm roam into llama territory. 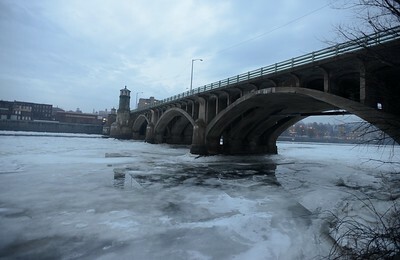 RYAN HUTTON/ staff photo Ice collects on the supports of the Basiliere Bridge over a partially frozen Merrimack River. RYAN HUTTON/Staff photo Felicia Pirrello, 1, of Wakefield, eyes a cow in its pen on the first day of the Topsfield Fair on Friday. RYAN HUTTON/ Staff photo. 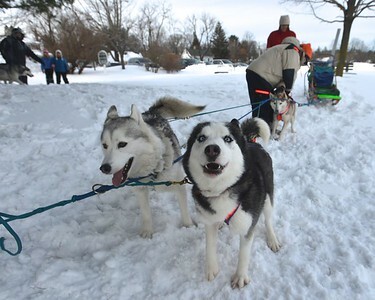 Sled dogs bark and howl as they wait to take off during a dog sled demonstration at Hoodkroft Country Club as part of the Derry Frost Festival. 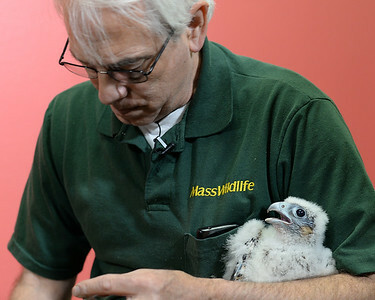 RYAN HUTTON/Staff photo Tom French of MassWildlife one of four peregrine falcon chicks that were recently born to UMass Lowell's adopted "River Hawks" Merri and Lance on top of the 18-story Fox Hall three weeks ago. 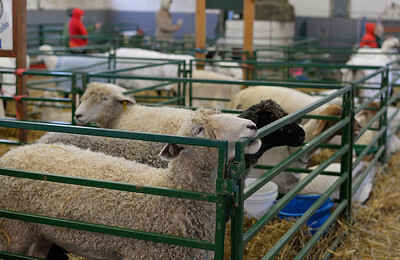 RYAN HUTTON/Staff photo A sheep tries to chew its way to freedom at the Topsfield Fair. RYAN HUTTON/ Staff photo. 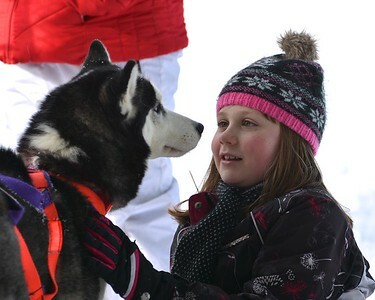 Alanna Cassen, 10, makes friends with one of the sled dogs brought to Hoodkroft Country Club as part of the sled dog demonstration being put on for the Derry Frost Festival. 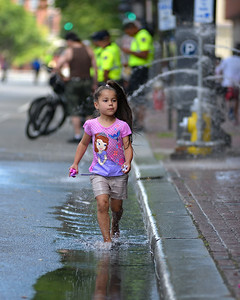 RYAN HUTTON/ Staff photo Linanie Santano, 4, splashes in the stream made by an open fire hydrant on a closed-down Essex Street in Lawrence for the city health task force's Ciclovía Event. 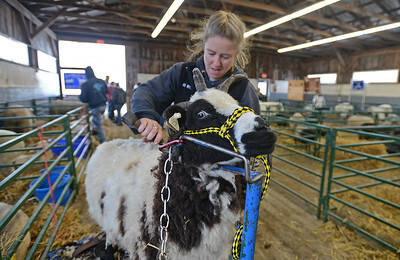 RYAN HUTTON/Staff photo Michaela Krafve from Krafve Farms sheers a Jacob Sheep on the first day of the Topsfield Fair. 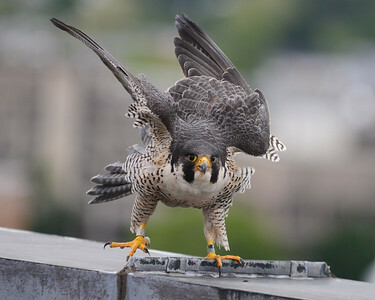 RYAN HUTTON/Staff photo Merri, one of the adult peregrines falcons that lives on top of UMass Lowell's Fox Hall, lands on the edge of the roof after MassWildlife personnel returned her four, three-week-old chicks after tagging them. RYAN HUTTON/ Staff photo Jack Doherty, 9, waits for a bite after casting his line off a dock into Beaver Lake while participating in the Derry Village Rotary Club youth fishing derby on Sunday. RYAN HUTTON/ Staff photo Five tandem bicycles are available at Harold Parker State Forest for guided bike rides around the campgrounds. RYAN HUTTON/ Staff photo Jen Agosti, right, points out some signs of recent beaver activity to Cole Christiansen, 5, left, and his dad Brian as well as her own som Andrew, 8, during a guided hike at Harold Parker State Forest put on by the Friends of North Andover Trails on Sunday. 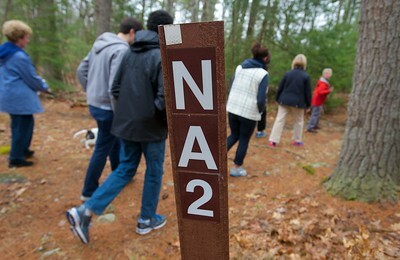 RYAN HUTTON/ Staff photo Hikers cross North Andover trail 2 during hike at Harold Parker State Forest guided by the Friends of North Andover Trails on Sunday. 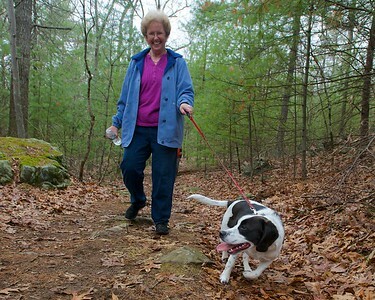 RYAN HUTTON/ Staff photo Mary Ann Limpert lets her dog Wilbur take the lead on a trail in Harold Parker State Forest during a guided hike put on by the Friends of North Andover Trails on Sunday.